How can America’s International Travel Expert® help you? Need help promoting your travel-related business? >> Being recommended by America’s International Travel Expert® would certainly boost your image. Want more exposure on Social Media? >> I can write posts and tweets for you as well as do re-posts and re-tweets on my sites and yours! Do you agree that being recognized as “The Best” by America’s International Travel Expert® will build credibility and increase business? Even if your business is not travel-related, what customer wouldn’t want to do business with someone recommended by America’s International Travel Expert®? >> We can create videos, alternating testimonials, and even do some Facebook Live events to promote your business. 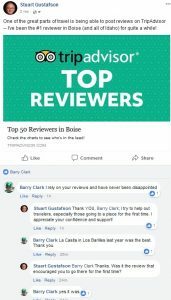 Does your target audience look at TripAdvisor reviews? 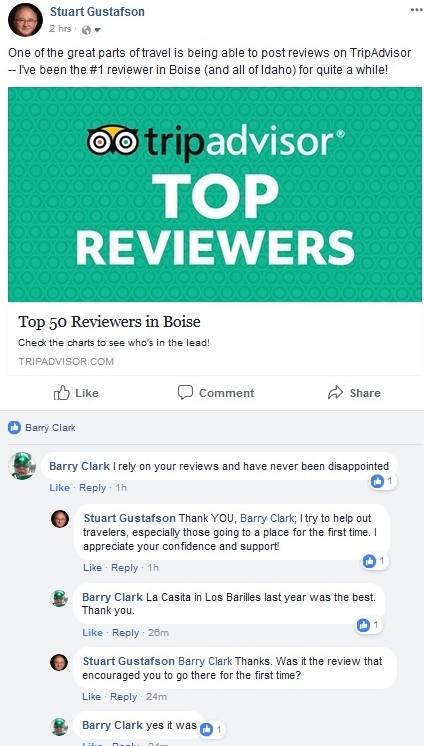 >> I’m the #1 TripAdvisor reviewer in the state; my review of a boutique hotel had 1,664 readers in the first week. >> That’s what I do; provide honest and engaging reviews that create action from potential customers. I’ve done FAM trips, press trips, sponsorships, speaking engagements, all for the ultimate benefit of the end-customer, the traveler. I can help you help your clients and customers with all forms of media that best represent your business and values to result in an increase in revenue for you. Curious about my “contract”? Click Here to view and print my Services Agreement. I do require this to be signed by my clients; as you read it you will see that this Agreement alone does not create any obligation on your part. The only time there is an actual commitment from you is when we both sign a Statement of Work (“SOW”) describing what I will do for you and what you will pay me to do that work. Click Here to see what that single-page SOW looks like. With my university degrees (B.A. in Mathematics plus an MBA) combined with my writing experience (14 published books), I am a stickler for grammar while presenting information in a comfortable and readable form. What types of projects are you seeking? I work with other like-minded travelers and travel bloggers who share my social media so that your exposure is multiplied. There’s no obligation to make a query; CLICK HERE for the Contact form and let me know how to reach you.